A puzzle printed on a square grid of nine large squares each subdivided into nine smaller squares, the object of which is to fill in each of the 81 squares so that each column, row, and large square contains every number from 1 to 9. Sudoku is a great mental activity that is fun. While I am having fun, I am engaged in a mental activity that builds my memory and improves brain health. For quite some time, I have wanted to find an activity that I could enjoy while I wait for an appointment or for a family member, when I am traveling, etc.. I have tried reading, but I have difficulty focusing on quality reading material when in public places. I enjoy reading short magazine articles about famous people, but I desired to do something more productive or to build a talent. I also tried doing crossword puzzles but I am terrible at those. Then I tried doing both cross stitch and crocheting, but they required more time than I had available to become proficient at these hobbies so I am really pleased to finally discover Sudoku a great mental activity. I can tell I am enjoying myself when I solve Sudoku puzzles because I would rather not stop once I start a puzzle, and I don’t tire easily of this game. I also have been gently looking for an activity to improve my memory and to prevent Alzheimer’s disease. When I am solving a Sudoku puzzle, I can feel my brain is working, thinking, and struggling. Although I have only been doing these puzzles for a few months, I have already noticed an increase in my ability to remember. It is my hope if I keep solving Sudoku puzzles, it will keep my mind younger and healthier. I can tell without doubt Sudoku a great mental activity is a good choice to enhance my mental health. While playing Sudoku you need to look at the big picture and figure out missing numbers that you can plug in the right places. I have been doing a lot of reading and writing, and when I feel like a need a break, I find myself picking up a Sudoku puzzle. When I watch people play chess, it amazes me how focused they can be. Now I understand. When I am doing one of these puzzles, I do not want to stop until I complete it, and often times desire to do another one. 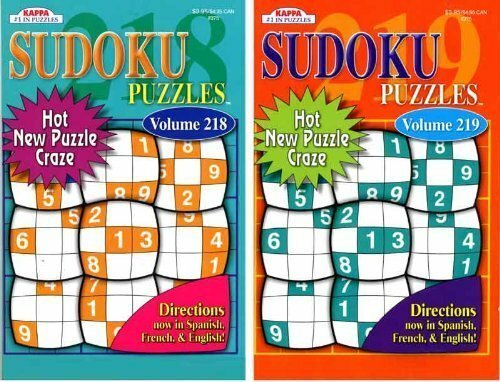 I have purchased three different brands of Sudoku Puzzles. My personal favorite is Kappa puzzles. The main reason I like Kappa best is that they print only one puzzle per page. When doing the difficult level, space is needed to write in the small number possibilities. If there isn’t enough room, it becomes messy and difficult to track what the various possibilities are. I suggest watching YouTube video samples of Sudoku to see if this type of puzzle perks your interest. To help me become more proficient at my new hobby, I watch the “Sudoku Guy” on YouTube. He is really good at teaching one concept at a time along with helpful tips and shortcuts.